There is a famous street in Bangkok called Khao San Road which is known as the "backpacker ghetto". It has cheap rooms, cheap food, lots of bars and hence, lots of backpackers. 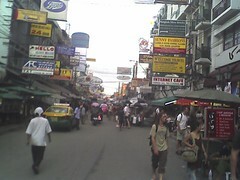 Before we arrived in Bangkok for the first time, people said "Go see Khao San, but don't stay there". Being you can't get there by train and Bangkok traffic is a joke, we didn't make it to Khao San Rd. until today (our 3rd visit to Bangkok). I'm really glad we're not staying there. Something that I've learned about my travel style is that I don't want to be surrounded by other travelers. Seeing other westerners in a secluded temple in Kyoto takes something away from the experience for me. I'd prefer to feel like the only foreigner in a place that no one can find. When I look at Khao San road, I see the opposite of that. It's wall-to-wall backpackers, strutting around with their day-old dreadlocks, sunburned cheeks and too-cool-for-school attitudes. Though we carry a backpack, it is abundantly clear to us that we don't identify with the average 20 year old unkept-and-proud backpacker. It seems that the badge of honor among backpackers is to appear that your lodging does not have a shower. It also seems that Khao San road is as much about travel fashion and looking cool for other backpackers than anything else, and I'm over it. And yes, I am perhaps jealous that I'm not that young anymore and realize that I sound even older. If I were 20, though, I'd love Khao San Rd. and would be right there with them. But as a 32 year old traveler with a backpack, I can't help but wonder if the Bangkok they experience happens without the company of 15 other people wearing a "Same Same But Different" t-shirt.